Steven Hill, Fox News Business Network, Varney & Co., May 9, 2012, www.foxbusiness.com/on-air/varney-co/index.html#/v/1630232526001/hill-eurozone-isnt-broken/?playlist_id=87060. Steven Hill also on Pacifica’s KPFK in Los Angeles, May 8, 2012, kpfk_120508_080030uprising.MP3 (broadcast begins around the 2:30 mark). You may reach Steven Hill on Twitter, Facebook, or by email. 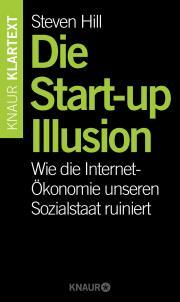 Die Startup Illusion: Wie die Internet-Ökonomie unseren Sozialstaat ruiniert. Find out more info at www.Startup-Illusion.com. Raw Deal: How the "Uber Economy" and Runaway Capitalism are Screwing American Workers. Find out more info at www.RawDealBook.com. 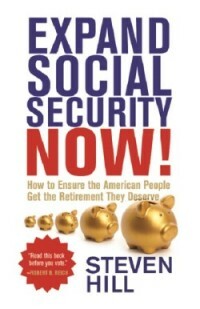 Expand Social Security Now: How to Ensure Americans Get the Retirement They Deserve . Find out more info at www.ExpandSocial Security.net. 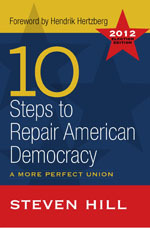 10 Steps to Repair American Democracy, 2012 Election Edition. Find out more info at www.10Steps.net. 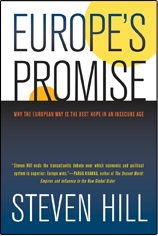 Europe's Promise: Why the European Way is the Best Hope in an Insecure Age. Find out more info at www.EuropesPromise.org. A provocative, remedy-based perspective on the joint complexities of economic stability and ever expanding technology. This book is a must read for those concerned about how technology is disrupting the way we work and eroding the social safety net, and how policy makers should respond to ensure that the growing number of workers in the “gig” economy earn adequate benefits. For many years, Steven Hill’s analysis, commentary and activism have helped shape our understanding of the U.S. political economy. His latest book, Raw Deal is A riveting expose that shows with alarming lucidity what Americans stand to lose if we don’t figure out how to rein in the technological giants that are threatening the American Dream. 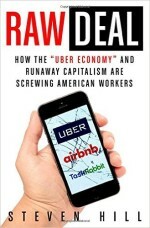 Raw Deal combines compelling stories with lots of evidence and policy prescriptions in a one-of-a-kind book on the “new economy.” Getting below the techno-babble hype about “sharing” and “disruption,” Hill shows the enormous human costs of “no rules” labor markets. In Raw Deal, Steven Hill documents in frightening detail the ways in which new forms of work promise to plunge US workers and their families into further economic hardship, risk-assumption, and instability. Fortunately, Hill does not simply anticipate catastrophe; he closes the book with an informed call for institutional reforms that would lessen the negative consequences of these potentially dangerous forms of work. Anyone concerned with US working conditions – whether American workers, worker advocates, labor market scholars, or policy-makers – must read this book . Copyright © 2019 Steven Hill. All Rights Reserved.